Poway Mayor Steve Vaus says one answer the region's housing crisis could be found right in backyards. He's now pitching a plan for his city to lay out the money to make it happen. Under the plan, the city would pay for a granny flat in a homeowner's backyard to be rented as an affordable unit for 10 to 12 years. The homeowner would get a third of the rent. Once that time elapses, the homeowner gets the unit outright. "I don't think any one idea or any one project is going to fill the need, it's going to take all of these chipping away at it and we'll get there," Vaus said. Vaus says North Poway could be an ideal area for the flats. The homes are on much bigger lots, so the flats - as small as 400 square feet - would be able to fit. Julie Abremski, who lives in North Poway, said she applauded the mayor's creativity for bringing affordable housing, but wasn't sure the neighborhood would be enthusiastic about the idea. "It's kind of awkward to have a total stranger living in your backyard," she said. "This is not an area that's looking to add to our own pockets." Abremski also expressed concern about costs and taxes. 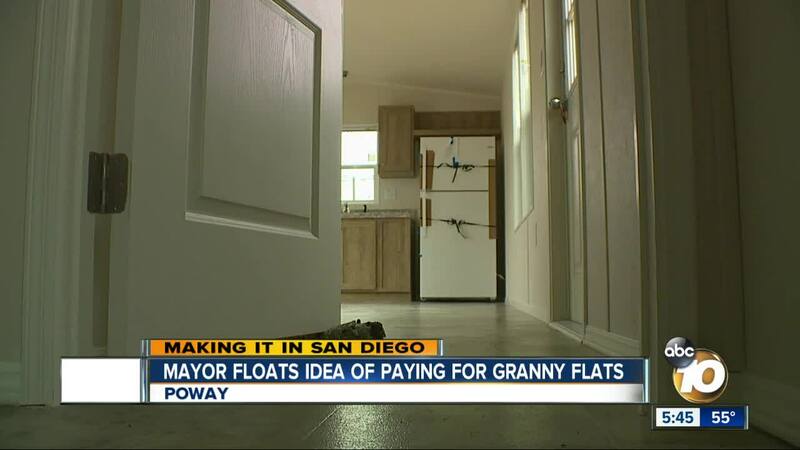 Multiple builders said a basic granny flat could go for about $300 per square-foot. Vaus isn't buying that figure. "It can be done for much less than that," he said, noting there would be a deed restriction on homes protecting the city. Vaus is presenting his idea to the City Council on Tuesday. If there's support, the city could study the issue further. Vaus hopes to start with five to 10 homes.